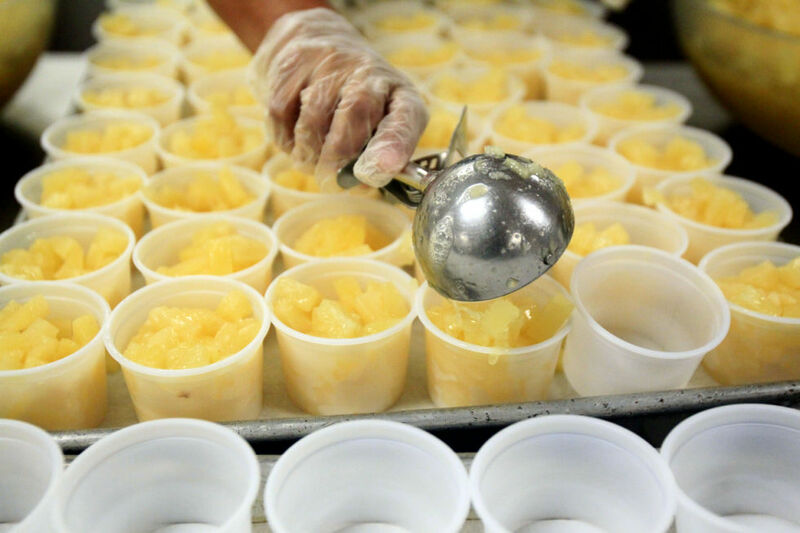 Pineapple slices are placed in cups as child nutrition workers prepare meals for the next day during the Summer Food & Nutrition Program on Thursday July 31, 2014 in McAllen. The program provides free nutritious meals at selected locations to children 18 years of age and under. McALLEN — As children from across the Rio Grande Valley begin to enjoy their summer vacation, school districts and other organizations across the region are announcing the locations where children 18 and younger can receive free meals. Most summer feeding programs throughout the Valley’s school districts begin today, with a few of the larger districts not only offering meals on school sites but also sending out buses to deliver these meals at the harder-to-reach areas. The McAllen school district, for example, will have 40 sites, including schools, Boys and Girls Clubs, and area parks, as well as eight bus routes that will operate Monday through Friday for the most part. Most locations and routes will be serving breakfast from 7:30 to 8:30 a.m., or 8 to 9 a.m. and lunch between 11 a.m. and 12:45 p.m. Some of the other McAllen school district locations will focus on snacks between 2 and 2:30 p.m. or 2:45 and 3:15 p.m., and dinner between 4:30 and 5 p.m. or 6 and 7 p.m.
Other school districts, including Mission, Edinburg, Pharr-San Juan-Alamo and South Texas are also offering summer meals, which for the most part run from June to August, through the Texas Department of Agriculture and the United States Department of Agriculture’s Summer Seamless Option or the Summer Food Service Program. These programs also allow other government entities and nonprofit organizations, such as summer camps and churches, to use the program and host a summer meals site. And while each district has their summer hours and locations posted on their websites, TDA is also offering several options for community members to receive information. These include texting FOODTX or COMIDA to 877-877 for information in English or Spanish respectively, calling 211 to get over-the-phone information also in English or Spanish, or visiting their website at summerfood.org. “Meals are provided to individuals 18 years old or younger without charge, as well as adults over the age of 18 who are determined by a state or local educational agency to have a mental or physical disability and who participate in a public or private school program established for people with mental or physical disabilities,” a TDA news release states.